TMREIS TMRJC CET 2019 for Inter 1st Year Admission Notification 2019 Online Application | Telangana Minority Residential Junior College Inter Admission 2019 : TMR Junior Colleges Inter 1st year Admissions 2019 (TMREIS TS Minority Welfare): TS Minority Residential Junior Colleges Entrance Test 2019 for TMREIS Inter 1st year Admissions: Telangana Minorities Residential Educational Institutions Society Hyderabad has issued the TS Minority Residential Junior Colleges Entrance Test for Admission into Inter first year admissions 2019-2020. Applications are invited through TMREIS Official website tmreis.telangana.gov.in from the eligible candidates from Minorities (Muslims, Christians, Parsis, Jains, Sikhs& Buddhists) and Non- Minorities (SCs, STs, BCs & OCs) Communities for Fresh Admissions into Intermediate First Year in TMR Colleges of Telangana State. Online Enrollment for Intermeidate first year admissions in TMR Junior Colleges 2019. Online Registration for TMR Junior Colleges will start from 25-02-2019. 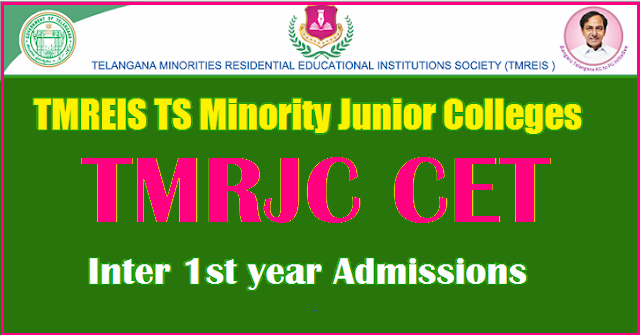 TMRJC CET 2019 for TS Minority Residential Junior Colleges Inter 1st year Admissions selection process, how to apply, last date to apply online, exam date and more details here. 1. Study Particulars: The candidates must have passed SSC/X Class Board Examinations or equivalent examinations in one attempt in March 2019 in Telangana State. 2. The Age: The candidate should not cross 18 years of age as on 31-08-2019. 3. Annual Income of Family: For Rural candidates the Annual Income should be below 1.5 Lakhs,for urban candidates below 2.0 Lakhs. (Income Limit is not applicable to disabled and Armed Force/Ex-Servicemen/Widows of Ex-Servicemen Children). 4. Nativity: The candidate should be resident of any district of Telangana State. Candidate should be medically fit at the time of admission. Part II: Second Language; Any one of the following Telugu, Urdu. a. Mathematics, Physics and Chemistry (MPC). b. Biological Sciences consisting Botany, Zoology, Physics and Chemistry (Bi.P.C). c. Mathematics, Economics & Commerce (MEC). d. Commerce, Economics & Civics (CEC). Study Particulars: The candidates must be appearing for SSC/10th class Board Examinations to be held in March/April, 2019 on regular basis. However at the time of admission the candidate must have passed SSC/X class Board examination held in March/April 2019 with minimum of 6.0 CGPA. 1. The candidate who opt MPC group should have been secured minimum average marks of 60%or CGPA 6.0 and B2 grade in Mathematics subject in SSC/X Class Board Examination. 2. The candidates who optBiPC group should have been secured minimum average marks of 60% or CGPA 6.0 and B2 grade in Science subject in SSC/X Class Board Examination. 3. The candidates who opt MEC group should have been secured minimum average marks of 60% or CGPA 6.0 and B2 grade in Mathematics subject in SSC/X Class Board Examination. 4. The candidates who opt CEC group should have been secured minimum average marks of 60% or CGPA 6.0 in SSC/X class Board Examination is sufficient. The candidate may opt any one of the two groups MPC/BiPC, or MEC/CEC) in Part – III subjects. However he/she can give order of preference of these two groups as per his/her choice for admission. MEC and CEC groups are available only in TMR Jr. College Nagaram, Nizamabad Dist. a) Mathematics, Physics and Chemistry (MPC). b) Biological Sciences consisting Botany, Zoology, Physics and Chemistry (BiPC). The selected Students shall submit all required Certificates at the time of Admission. The candidate should not cross 18 Years of age as on 31-08-2019. Following documents in original with one set of Xerox copies should be submitted by the selected candidate at the time of admission in the respective Jr. College. a) Memorandum of marks of SSC/X Class Board Exam. b) The candidates who have passed X class Board Exam other than SSC Board of Telangana they should submit the equivalence certificate issued by the competent authority. c) Date of Birth and Study certificate. e) Aadhaar card (photo copy). f) Parents Annual Income Certificate. h) For disabled candidate’s medical certificate issued by concerned medical officer. i) For Armed Force personnel/Ex- servicemen children – certificate obtained from concerned authorities. j) Converted Christians – Certificate issued by Tahsildar. k) Two Passport size Photographs of candidates and one Photograph of Parents. l) In respect of candidates participation in Sports/NCC/Scout/Guide/Exhibition they should submit the participation certificate issued by the concerned authorities. Note:Income Limit is not applicable to disabled and Armed Force/Ex-Servicemen Children.